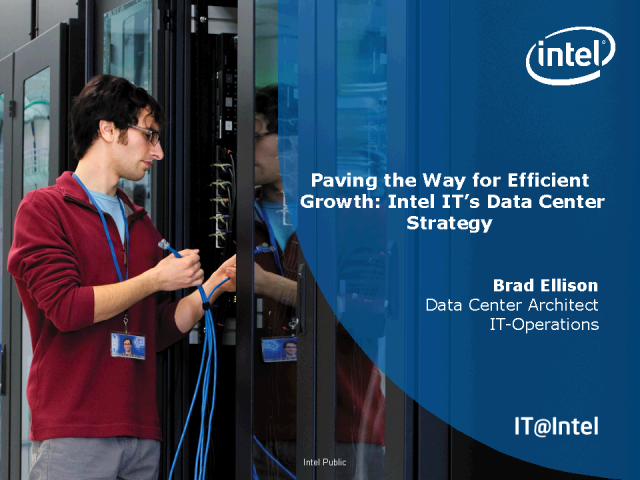 Learn about Intel IT’s data center strategy that is on track to create $650 million of value for Intel. Through strategies such as server refresh, virtualization and adopting the latest compute technologies, Intel IT has been able to increase performance 2.5X while reducing capital investments by 65%. Learn how Intel IT has built a model to measure and monitor our IT environment. This model includes data center, office and client computing. Come hear how our results have helped Intel to lower our carbon footprint. Kim Stevenson, Vice President Information Technology and General Manager, IT Global Operations and Services and Bill Guyon, IT Sustainability Program Manager, discuss the strong business case for managing our footprint and IT’s continued commitment to IT Sustainability. Join IT industry executives as they discuss the current state of storage in their environment, the challenges they’re facing, what's working, and the benefits they're achieving. Learn how Intel IT upgraded its network architecture to 10 Gigabit Ethernet connections to accommodate explosive data center growth and network demand. The presenters will discuss the benefits realized such as: reduced DC complexity, lower TCO, increased throughput and agility. Attendees will benefit by being able to apply Intel IT's best practices to their own data center initiatives. In addition, the presenters will address what the key tradeoffs were. •Is IT a cost center or a value center? •What do business leaders expect from IT this year? •Have these expectations for IT changed? •The key projects Intel IT has implemented and IT best practices that Intel IT has developed in delivering the value of IT to Intel. •What Intel IT is thinking about top-of-mind hot topics such as Cloud Computing, IT Consumerization and Security. •How Intel IT decides which investments are highest priority by developing and executing a multi-year IT Strategic Plan. This webinar will describe how Intel IT has shifted from a traditional static enterprise computing environment to a service-oriented environment, which is at the crux of a complete cloud environment. Virtualization is just one step to deploying cloud services and alone is insufficient. This webinar is a unique addition to our cloud series because it shows how Intel IT dynamically provides capacity to our business users on demand when they need it thereby removing IT from the critical path for business services. By instituting a hosting automation framework, we are establishing a true enterprise private cloud that provides a consumer focused self-service portal. Intel IT has significantly reduced provisioning time and is on a path to provision services in just three hours. This is the key to creating a more agile enterprise infrastructure to support a dynamic and ever-changing set of business requirements. Join this roundtable discussion moderated by Zen Kishimoto of AltaTerra Research who will be joined by Mark Thiele of Data Center Pulse, Chris Peters of IT@Intel & Joseph Tobolski of Accenture Technology Labs as they discuss the most recent cloud computing efficiencies. Join experts from Intel IT, The Green Grid and Data Center Pulse as they discuss their perspectives on the future of data centers – What is the current state of data centers? Where do they need to evolve? What does IT need to take into consideration when planning to support the business needs of the future? What are the problems we will face? Join this expert roundtable to hear the insights and experience of Mark Thiele, Vice President of Data Center Pulse, Dan Azevedo, Chairman of the Metrics and Measurements Working Group of The Green Grid, and Kim Stevenson, VP of Information Technology at Intel Corporation. As compute demands increase there’s a growing need to embrace new technologies and innovative approaches that optimize efficiency in our data centers. Please join Brad as he share’s some of the technologies that Intel IT has adopted around power, cooling and overall design, which have driven measurable results in our data centers. Learn about Intel IT’s proactive server refresh strategy that is on its way to deliver USD 250 million of value by 2014. Chris and Matt also share a tool that allows you to estimate the value of server refresh for your own organization. Learn about Intel IT's experiences and best practices with virtualization from 2005—when we began planning, engineering, and implementing a virtualized environment—to present day as we accelerate our virtualization efforts toward the continued development of our enterprise private cloud. Click "attend" below to register. Learn how Intel IT is approaching its cloud computing strategy and get insights on the approach that would work best for your organization. Learn about Intel IT’s data center strategy, best practices and experiences in the areas of facilities, storage, compute and networking. From cloud computing, virtualization and server sizing, to the latest cooling techniques, understand how Intel IT is addressing today’s data center trends and challenges.